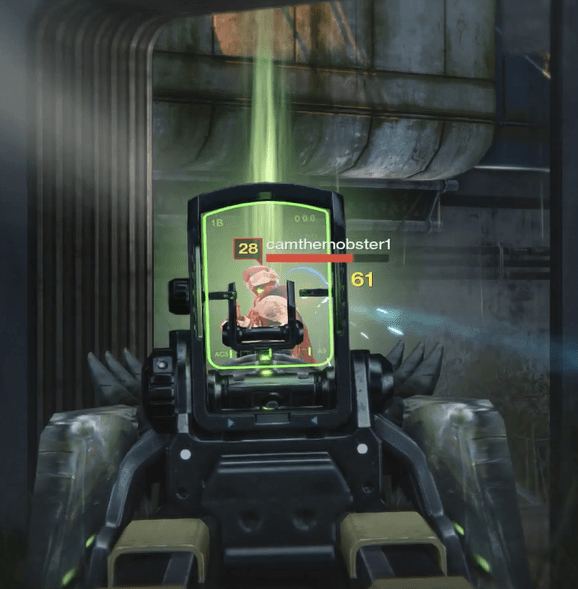 Fang of Ir Yût is a Legendary primary scout rifle. The good: Balanced stats, useful perks. The bad: Target Mark is situational at best. Conclusion: Probably the best Legendary scout rifle. 50% faster base reload when magazine is empty. Increases magazine size to 27. Fang of Ir Yût can be considered one of the best scout rifles in Destiny. Exclusively obtained from the level 33 difficulty of Crota’s End, it has a chance of dropping from Crota himself. Its stats are similar to the Vault of Glass scout rifle Vision of Confluence, but Fang of Ir Yût will obviously be better for Crota’s End. Fang of Ir Yût, one of the few primary weapons in Destiny with elemental damage, is a really solid choice for any activity, especially an Arc Burn Nightfall. Its rate of fire is shared by many of the scout rifles such as The Saterienne Rapier, Another NitC, and Vision of Confluence. It can fire a full magazine (15 without Field Scout) in as little as 4 seconds and will ADS in .30 seconds. Its Impact is also tied with The Saterienne Rapier, Another NitC, and Vision of Confluence. Tier 1 enemies will take 340 damage to the body and 1019 damage to the head. Tier 2 (major) enemies will take 306 to the body and 459 to the head. Guardians in the Crucible will take 41 to the body and 61 on a critical hit. The range of 75 is actually higher than Vision of Confluence, but Badger CCL just barely trumps it. The high range allows this scout rifle to be a worthy sniper rifle alternative in some circumstances. The base reload speed, without any upgrades, sits at 2.15 seconds. Fortunately with the Spray and Play perk, reloading when the magazine is empty, the reload can be increased to a quick 1.4 seconds. Fang of Ir Yût comes with a very wide arrange of scopes and perks, and they’re all very good. The perks allow you to to customize the weapon the way you want to, and they’re all useful in their own way, sometimes making it hard to choose. 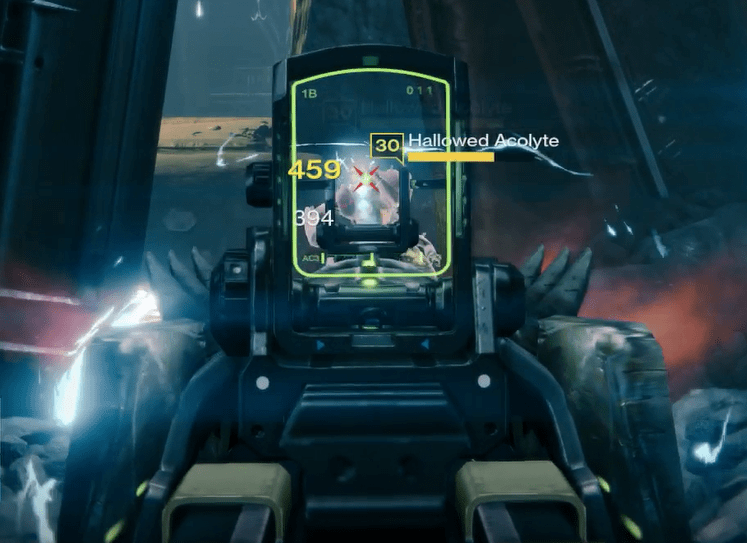 As with each of the Crota’s End raid weapons, Hive Disruptor will provide 394 additional damage to Hive Majors. This scout rifle only comes with only 15 rounds in the magazine. It’s lower than Vision of Confluence, but it’s about on par with the rest of the Legendary scout rifles. We recommend upgrading the magazine size with Field Scout, but only if you can live without the extra stability you’d gain from Perfect Balance. The Target Mark perk is interesting, as it places a large green pulsating beacon for about 5 seconds, but doesn’t really feel useful outside of very niche circumstances. If the cover is low enough you can see exactly where they are, but it won’t allow you to see enemies through walls. In PvE, Target Mark is useful to let your party members know which target you are hitting if voice communication isn’t available for you. However, most of the mobs you kill die too quickly for it to really be of any use. Target Mark just can’t compare to a decrease in reload speed though, making “Spray and Play” almost always the better choice. There’s really not much that Fang of Ir Yût can be faulted for. Each of its stats are balanced and the perks are awesome. Fang of Ir Yût, like each of the Legendary weapons from Crota’s End, has a seemingly ‘normal’ base model with various bones and other hive looking bits growing out of it. Small green pulsating lights adorn parts of the weapon as well, which also light up when you press the trigger down. 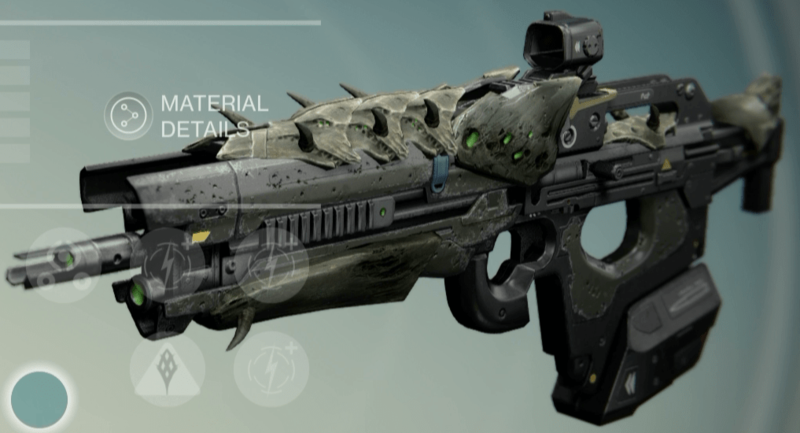 Due to its versatility, Fang of Ir Yût is easily one of the top scout rifles for PvE/PvP. Its perk set allows it to be a powerhouse weapon in the Crucible due to Third Eye, high stability, and reload speed with Spray and Play. A few tweaks later and it is destroying Hive with extra damage and a massive 27 round magazine. While it lacks full auto, it is still an extremely easy-to-use weapon for all situations. Own this weapon, upgrade it, use it. For PvP this weapon earns a 9/10 and for PvE a 9/10.